Writing in 1979, Sontag could never have anticipated the explosion of photography that came with the introduction and rapid dissemination of the digital camera. Today, to be a tourist is primally to see places and people through the lens of a digital camera. This recent shift to digital technology has resulted in an unimaginable increase in the sheer volume of pictures taken; from my own experience, in the three years after 2003 I took nearly 1500 photographs on my old Pentax SLR-camera; post-digital, I’ve amassed over 14,000 images in the past three years alone and probably taken at least double that. It’s not just the quantity of images that has changed: we also perceive the world differently through a digital camera – from the considered setting up of shots and the awareness of the finite resources of film to a faster, more throwaway kind of perception, one that tends towards amassing rather than reflection. John Urry has reflected on the role of photography in contemporary tourism. His definition of the ‘tourist gaze’ is bound up with a certain kind of perception, one that is focused on looking at objects in a specific way. For the tourist (and we are all tourists to some extent), photography becomes part of the construction of objects to gaze at – a search for the photogenic itself which tends to turn the environment into a series of snapshot images to be recalled when we’ve returned home. Yet, as Urry states, many tourists are often disappointed with their photographs because their memories of a view or place are richer and fuller than their photographs. However, this doesn’t necessarily lead to a questioning of the ability of photography to ‘capture’ this fuller picture, or indeed of the search for an alternative. An hour in the square east of the Giralda in Seville on a warm afternoon at the end of October in 2009. 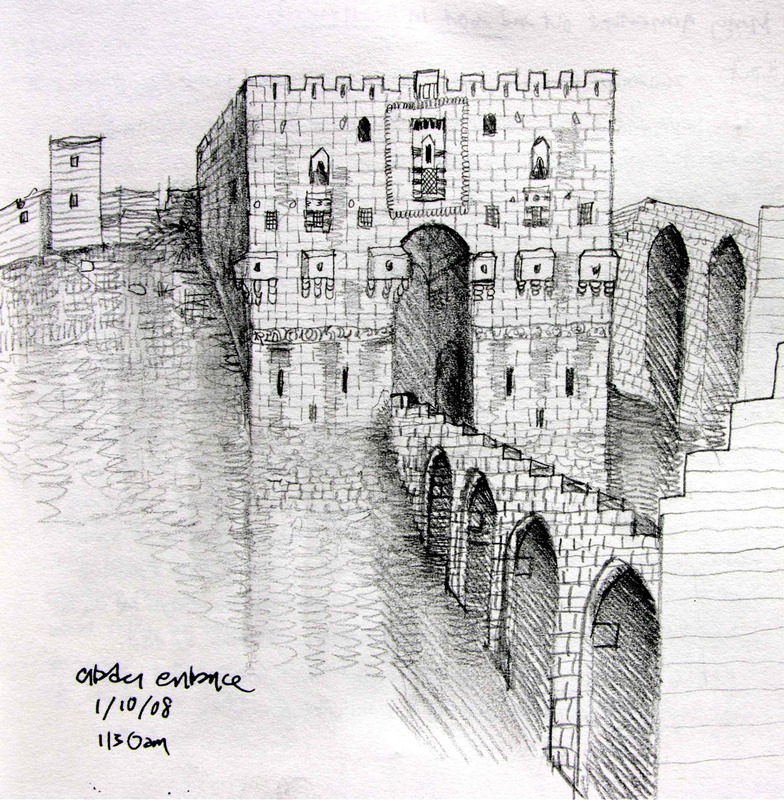 As my drawing moved slowly down from the top to the bottom of the tower, hammering continued in the square, along with a procession of tourists arriving and leaving the city, bags on wheels and taxis coming and going. This commanding building, with such a pronounced sense of the vertical, seems to require some kind of extended contemplation, especially when the gigantic bells start ringing, which they did as I sketched, creating a sound which seems to fill the whole city. On my way back from a walk up the back of Carnedd Dafydd, to admire its cliffs, I stopped in the Nant Francon valley, just before reaching the cottage where I was staying, and decided to sketch the view. In rapidly-fading light and a plummeting temperature, I hurriedly drew the forms of the mountains that filled sides and head of the valley, their names already familiar in my mind – Carnedd Dafydd, Tryfan, the Glyders, Foel Goch. The light was crystal clear, as it had been for days, but the cold was finger-numbing and the drawing had to be done very quickly. Despite this, the result still pleases me as it reminds me of the conditions under which it was made. 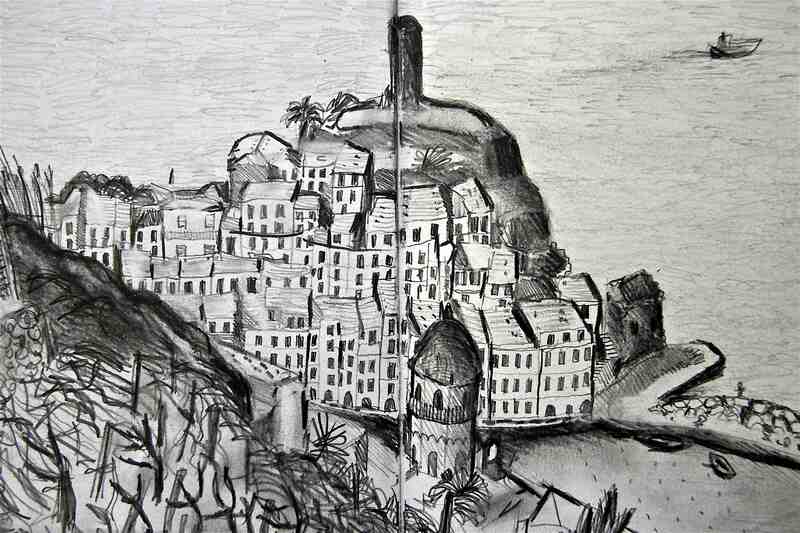 A second visit to the beautiful coast of Liguria in Italy and its ‘five lands’, this sketch of Vernazza, where I was staying, was made sitting on a wall in the first hot sunshine I’d experienced that year. Here, drawing was limited by uncomfortable heat and the heavy lines indicate a rather hurried method. But I also remember a deliberate sense of slowing down in response to a time of crisis in my life – a sense of wanting to stop, to allow myself some space. 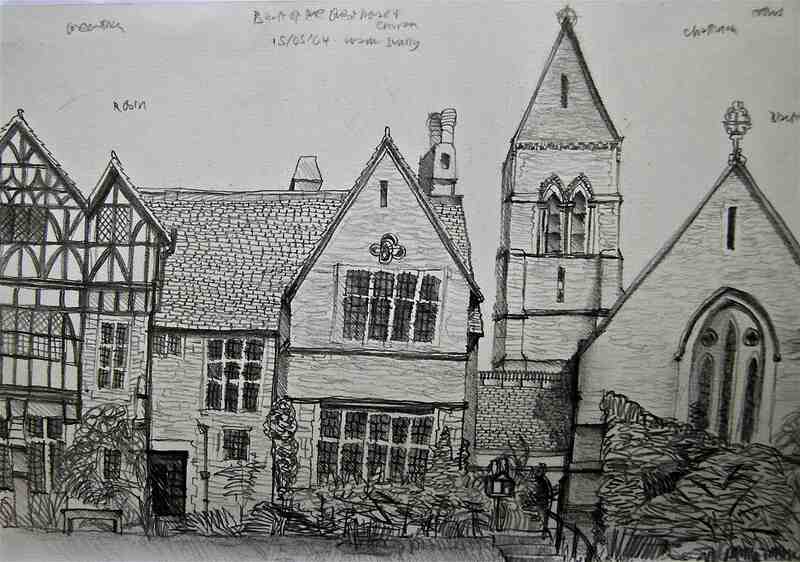 Here, sketching was one of the ways I did this, in a familiar environment where the ‘sights’ had already been seen on a previous visit. Here, the finished drawing is less important than the context in which it was drawn. It’s not a very good sketch, primarily because, for most of the time I was drawing the citadel, I was surrounded by a group of 20 boys celebrating with their Eid presents – replica guns which they brandished at me and at each other. They also jibed me with ridiculous questions, jostled my arms and even tried to help me with the drawing, adding bits here and there. As a result I retreated to a nearby empty cafe, ate an expensive and horribly tepid lunch and ended up in the hospital the following day with a nasty case of food poisoning that was initially and very worryingly diagnosed as an inflamed appendix.